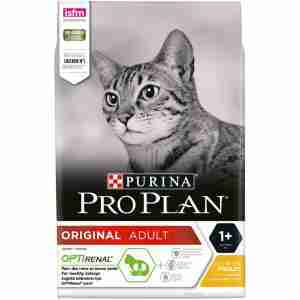 PURINA PRO PLAN Adult OPTIRENAL Rich in Chicken & Rice for the healthy maintenance of adult cats. Combines all essential nutrients including vitamins A, C and E, also omega 3 & 6 fatty acids and a natural prebiotic in a high quality diet for cats. Contains OPTIRENAL, a unique formulation to promote healthy kidneys. OPTIRENAL is a scientifically designed combination of ingredients including amino acids, essential fatty acids and antioxidants. Chicken (21%), rice (16%), maize gluten meal, dehydrated poultry protein, maize, wheat, animal fat (protected by mixed tocopherols), digest, dried whole egg, chicory root (2%), yeast, pea protein concentrate, fish oil, potassium chloride, calcium carbonate, minerals, choline chloride, L-arginine, L-lysine, sodium chloride, DL-methionine. Additives: Beta-carotene, Tocopherol rich extracts of natural origin, Ortho phosphoric acid. Katyana, Kat for short, absolutely loves these. She's not fussed about wet food although she does eat some but these are her favorites and her staple diet. I don't know what we would do if we could not get these. This is the best food I've ever found for keeping our cats healthy. It even helped an elderly, poorly cat which we adopted to improve, stay well and live a good time. Excellent service from MedicAnimal as usual in regard to my order. Both cats enjoy this chicken and rice product which we have been using now for nearly 4 years, along with wet food once a day.